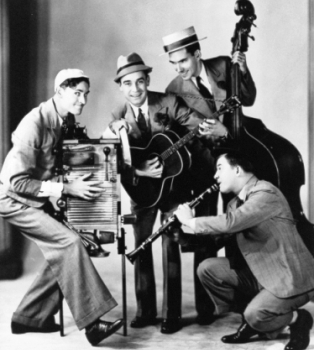 The Hoosier Hot Shots brought laughs with their madcap musical antics on radio, recordings, and movies. The quartet first gained fame in the early days of WOWO, Fort Wayne, and in 1933 moved to WLS, Chicago, where they were a regular feature for 13 years on the Saturday night National Barn Dance carried by the NBC network. In the early 1950’s they had their own show on the Mutual network. The Hot Shots appeared in over 20 western movies.